I made this Valentine card for another friend for his friend. I wanted to make it special as she is to him. I hope you all like it. I also put this in another challenge tonight. To make this card these are the things I needed. Stampin' UP! 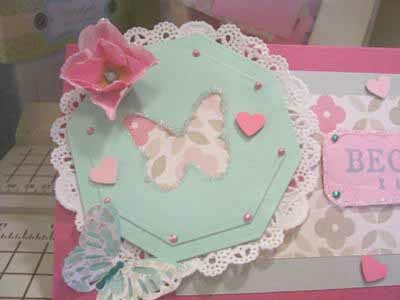 card stock ~ Aqua, Pink, Rose & Gray. 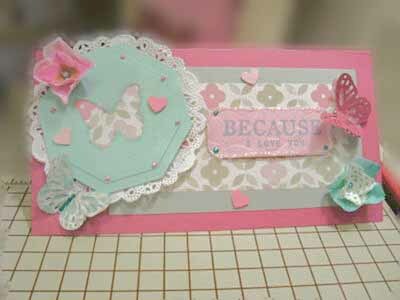 I chose to use the Rose colored card stock for the main body of the card. 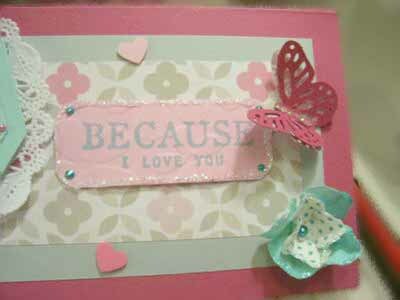 I then over-layered the gray card stock then the floral paper. I cut 2 octagon shapes (a large and a medium), and using my butterfly punch I punched the medium Octagon and glued the floral paper between the two. 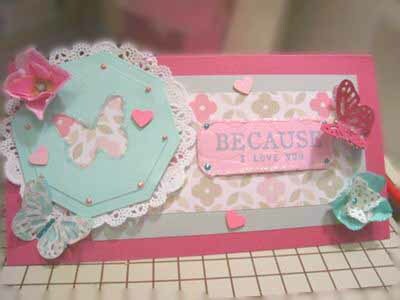 added some butterflies and flowers and a few little hearts around the card. I used my liquid pears on my octagon and on my small pink label and stamped it with MS Aqua Ink. I put my glitter glue along the edges of my flowers and around the label. I hope you all enjoy my Valentine card idea as much as I did creating it. I love your comments. Come visit my blog and maybe even become a follower.